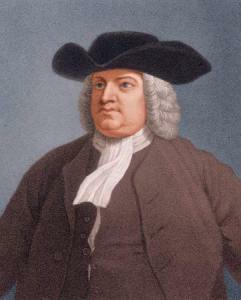 One of the more remarkable men in the history of colonial America has to be William Penn. He was imprisoned in England for his divergent religious views: he was a Quaker. Yet he was granted a huge tract of land in the New World that eventually became the state of Pennsylvania. How does someone go from a member of a persecuted group to a crown-ordained proprietor? It had to do with his father, Admiral William Penn, who was instrumental in bringing Charles II out of exile and installing him as king in 1662. When the elder Penn died, Charles still owed him plenty, both financially and in gratitude. That’s how the son came to be the recipient of the king’s largesse. Penn immediately had a vision for a colony that would welcome all to worship God according to their conscience. He didn’t worry about some group of atheists congregating in his colony; they were few and largely silent. So he advertised throughout Europe, promising every persecuted group of Christians that they could come to Pennsylvania and not only worship the way they chose, but also have a say in the government. Those kinds of promises were unheard of at that time. People flocked to the new colony: not only Quakers, but Mennonites, Moravians, what we now call the Amish, along with standard denominations like Lutherans. Penn would come to his colony now and again, and kept a watch over developments. I consider those principles to be rock solid. He that suffers his Difference with his Neighbour about the other World, to carry him beyond the Line of Moderation in this, is the worse for his Opinion, even though it be true. . . . Since all of all Parties profess to believe in God, Christ, the Spirit, and Scripture, that the Soul is immortal, that there are Eternal Rewards and Punishments, and that the Virtuous shall receive the One, and the Wicked suffer the Other: I say since this is the Common Faith of Christendom, let us all resolve in the Strength of God to live up to what we agree in, before we fall out so miserably about the Rest in which we differ. Translation, if necessary: We have more that unites us as Christians than things that drive us apart, so let’s work together. That view transcends all time periods, and is certainly applicable today.